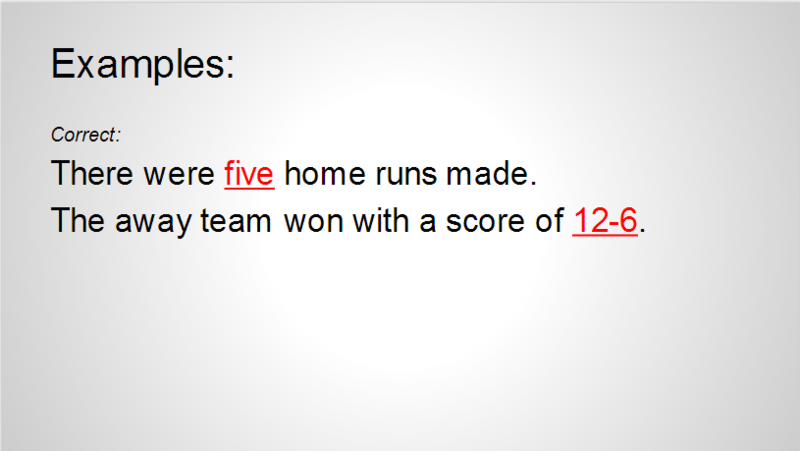 In this tutorial you will learn tips on how to write a AP styled sports story by learning when to capitalize, how to write out numbers and scores, and when to use abbreviations. 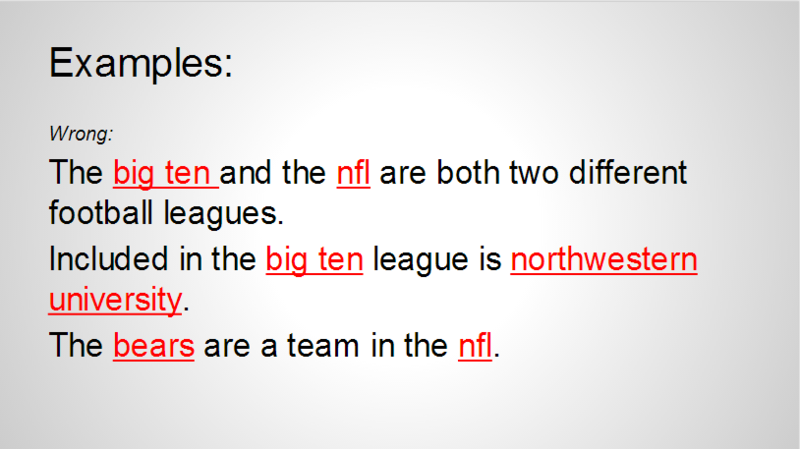 In the first sentence the Big Ten is not capitalized and the NFL is not in all caps. This is improper use of the AP style because leagues must be in capital letters because they are proper nouns. 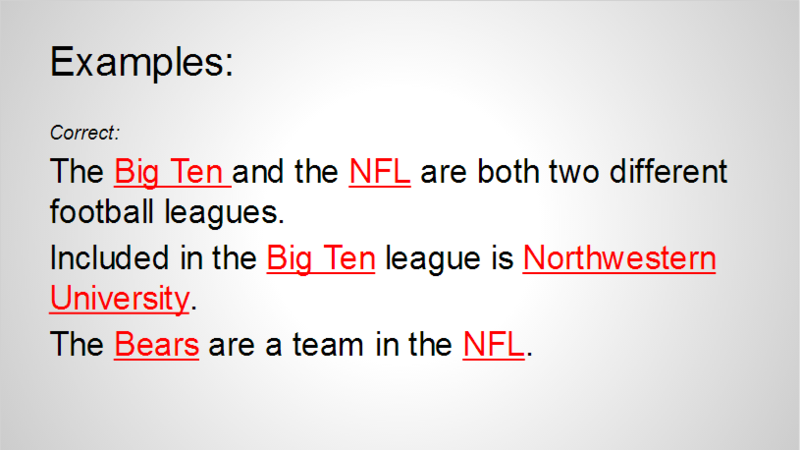 In the second sentence we see that the Big Ten and Northwestern University are both not capitalized. The Big Ten should be capitalized because it is a league and Northwestern University should be capitalized because it is a proper noun. In the third sentence the Bears is not capitalized and neither in the NFL. The NFL should be capitalized because it is a league. The Bears should be capitalized because they are a sports team and also a proper noun. In the first sentence we see that five is not spelled out. This is improper use of the AP style because all numbers under 10 should be spelled out. Every number that is 10 and above can be in numerals. But, there is an exception to this rule: numbers that are included in ending scores can be in numerals as long as there is a hyphen between the two scores. 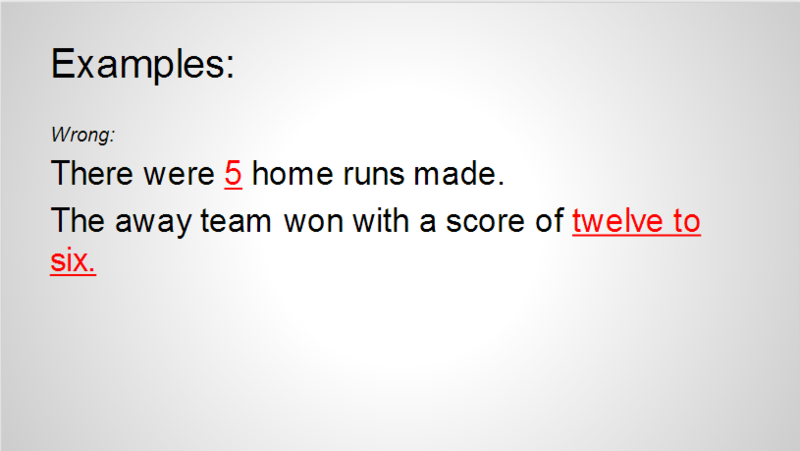 For example, in sentence number two we see that 12-6, the ending score of a game, is spelled out instead of in numerals and there is not a hyphen between 12 and six. This is bad AP style usage because when writing out the numbers of the scores there must be a hyphen between the two numbers, not “to”, and the numbers must be in numerals. Also, the winning score goes first. 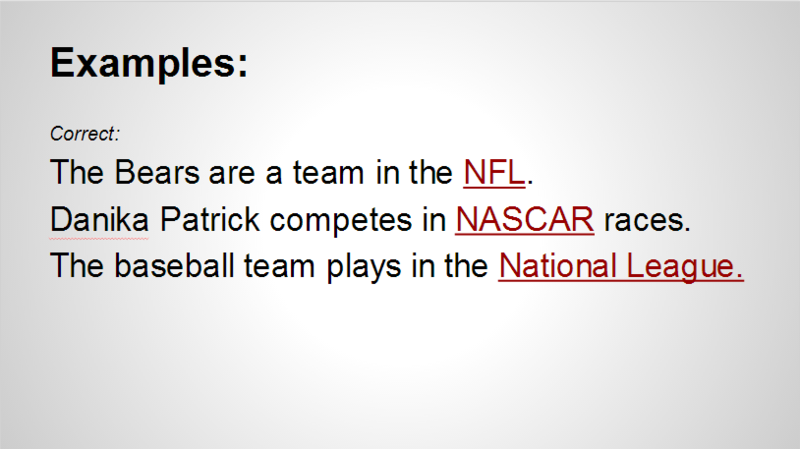 In the first sentence we see that NFL is spelled out and not abbreviated and in the second sentence we see the same with NASCAR. According to the AP Style Guidelines it is necessary to spell out common abbreviations. But, you can not abbreviate leagues. 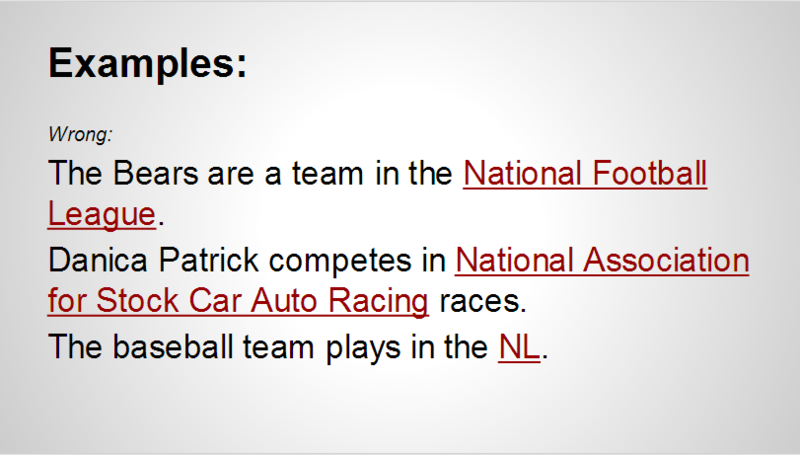 This is shown in the third sentence when National League is abbreviated.